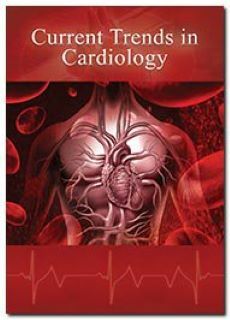 Current Trends in Cardiology is a peer-reviewed, scholarly journal aimed at worldwide dissemination of research developments in the field of cardiology and related issues. The journal focuses on the publication of scientific advancements pertaining to the development of more potent drugs, diagnostic techniques, valve therapy, stem cell therapyand other therapeutic approaches for the treatment of high risk patients of cardiac diseases. Current Trends in Cardiology aims to publish quality research in the form of clinical reports, case studies, conceptual breakthroughs and novel insights, research, review articles, short communications and scientific correspondences containing advanced research output in this field. Topics that are covered are apical hypertrophic cardiomyopathy, coronary artery ectasia, fetal heart calcification, chronic arterial insufficiency, peri-arrest period, complications after heart surgery, early repolarization symptoms, coronary arteritis, inflammatory vascular disease, inflammatory cardiomyopathy, systolic pressure variation, left atrium enlargement, ventricular septal defect (VSD), various heart and blood vessel disorders, myocardial infarction (heart attack), relevant issues of cardiac arrest, stroke, techniques and procedure used in stent implantation, anticoagulant drugs (blood thinners), basic research in heart structure and functions and other medical conditions and associated treatments, etc. The Journal is using Editorial Manager System for easy online tracking and managing of the manuscript processing. Current understanding of the electrocardiographic manifestations of the ?athlete?s heart?. It?s time to focus on decreasing cardiovascular mortality in NAFLD population: potential use of statins and PCSK9 inhibitors. Effect of ventricular relaxation performance on blood flow profiles in fontan circulation. Sudden death on the playing field: Can we prevent it? Angioplasty with drug-eluting stents versus bypass grafting for treatment of unprotected left main stem disease.